Camshaft alignment tool 1 – BMW No.11 4 281. Camshaft alignment tool 2 – BMW No.11 4 283. Flywheel/drive plate timing pin – BMW No.11 0 300. Camshaft position (CMP) sensor disc setting tool – BMW No.11 8 520. Ensure camshaft lobes for No.6 cylinder at rear of engine are positioned as shown  . Ensure camshaft alignment tools can be fitted  &  . Hold camshafts with spanner on hexagon  . Rotate camshaft until camshaft alignment tools can be fitted  . Install CMP sensor disc setting tool and fit to cylinder head  . Ensure dowel pins of CMP sensor disc setting tool  aligned with sensor disc locating holes  . Pre-load timing chain with pre-tensioning tool to 0,6 Nm  . CMP sensor disc setting tool  . Camshaft alignment tools  &  . 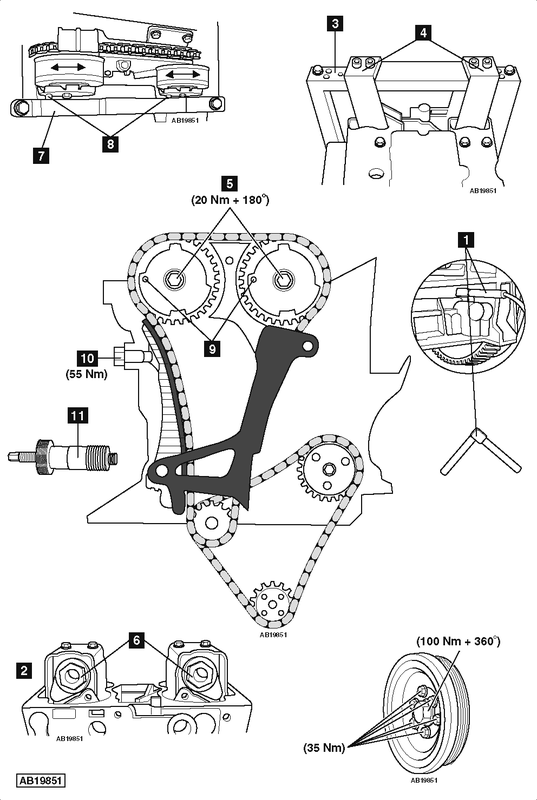 Install timing chain tensioner  . Tightening torque: 55 Nm. Ensure flywheel timing pin and camshaft alignment tools can be refitted  ,  &  . Do you have to reset the onboard computer in anyway when doing this job?